Lynd, Staughton. Solidarity Unionism: Rebuilding the Labor Movement from Below. Chicago: Charles H. Kerr, 1992. Paperback, 64 pages, $15.00. 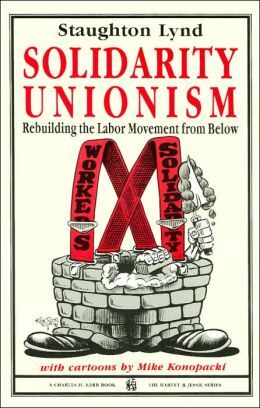 Staughton Lynd’s classic “Solidarity Unionism: Rebuilding the Labor Movement from Below” was inspired in part by the actions of the historical IWW and has inspired a new generation of Wobblies since it was originally published in 1992. Although the attack on the labor movement had begun much earlier, by 1992 the situation was beginning to look hopeless, and Lynd, a veteran of many years of struggles, put together this short book to show that a different approach was needed if workers were to resist the onslaught of the bosses. Lynd divides the book into four parts: two historical segments showing workerled unionism (what he calls “solidarity unionism”) in action and explaining how business unionism became the norm, and another two segments which explain his program for rebuilding the labor movement. The two primary examples he uses are about workers around Youngstown, Ohio, where workers across industries stuck together to fight wage and benefit cuts and the closing of the area’s major employers. He also looks at the origins of the Congress of Industrial Organizations, now the AFL-CIO, and how it began as a genuine expression of working-class selforganization. This was complete with a desire to implement independent labor politics as part of the political goals of these new unions, which operated with only the minimum of administration, because they were strongly based on relationships on the shop floor. An alternative unionism is presented by Lynd—one that is not hierarchical but instead is based on representation of workers to the bosses. Instead, solidarity unionism is the essence of workers associating together to present their needs and demands to capitalists and to create communities of support and care to achieve them. Instead of being based on internationals and executive committees, the basic unit of the solidarity unionist model is the shop floor committee. These committees “may exist in a non-union shop or…may function alongside official union structure,” writes Lynd. There are structural issues beyond how unions are organized in shops, according to Lynd. There lacks central labor bodies where workers across industries can come together to discuss their collective grievances and show solidarity for each other. While the AFL-CIO has bodies that supposedly fulfill this function, Lynd points to examples like IWW mixed locals (the precursor to our General Membership Branch) as more effective tools for promoting class-wide solidarity. Finally, Staughton Lynd says that solidarity unionism presupposes a society beyond capitalism, a socialist society. For Lynd “socialism is the project of making economic institutions democratic.” The best way to do this is to create combative organizations with prefigured structures, ones that reject hierarchy and practice democracy. Furthermore, they go beyond the workplace and enter the everyday lives of workers and their kin. “Solidarity Unionism” is an excellent place to start when thinking about what organizing workers should look like, but I believe there is a need to go beyond what Staughton Lynd has laid out. Luckily our union has a vibrant culture and some ideas on this have already come out. In particular, discussion pieces from experienced organizers like “Direct Unionism” and “Wobblyism: Revolutionary Unionism For Today” provides criticism and conversations on where we, as a union, might go with our organizing. A strength I think that “Direct Unionism” and “Wobblyism” have in building off of the tradition of solidarity unionism is taking a position against the state and the National Labor Relations Board (NLRB) process completely in our workplace organizing. Whereas solidarity unionism allows for use of capitalist structures like the NLRB, as long as it is not relied upon, in practice IWW campaigns that use these processes inherently become reliant on them. Something about the state is a magnet; once you are caught in its pull it is hard to get out. The much more difficult task of staying away, at the sacrifice of slower growth, may in the end be worth the wait. The end of the book brings up another aspect where we need to broaden the conversation around how we organize, and Staughton Lynd has given us a good place to start. Lynd calls for a labor movement that fights for the working class to control society, a labor movement that specifically fights for socialism. He writes: “Socialism is the only practical alternative to capitalism. We should turn our attention to defining clearly what kind of socialism we want.” Unfortunately this often falls by the wayside due to a culture that says “don’t think, organize!” The IWW would do well to clarify what sort of socialism we are looking for, because so far, we only have the vague insinuation of “abolition of the wage system.” Where Lynd fails is in thinking of socialism as a prefigurative form of organization…that content and form are synonymous. A case study of an IWW organizing drive will show that they are not; we need to conduct political education rooted in the real experiences of working people. We need to meet people where they are, but not to the preclusion of our revolutionary aims. Staughton Lynd’s “Solidarity Unionism” is an important book for the IWW and the lessons it contains should be well remembered by today’s Wobbly organizers. We should see the book as the beginning of a broader conversation about our organization, however, not as the end-allbe- all of organizing. There is a lot of work to be done to push IWW organizing into the direction of opposing mingling with the state and to take on a revolutionary political character. This process will take a lot of trial and error and hard, explicitly political conversations within our organization. The positive results of organizing the working class for the dismantlement of this society and the implementing of a new society will be worth the trouble. PM Press will publish a second edition of “Solidarity Unionism” in the spring of 2015, with a foreword by Manny Ness to the effect that solidarity unionism is happening all over the world.